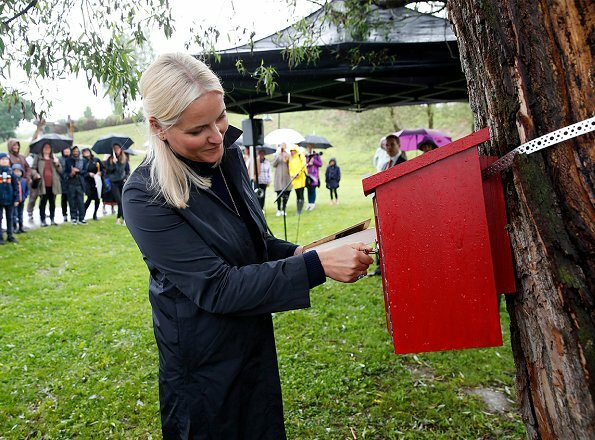 Crown Princess Mette-Marit of Norway travels on a Literary Train tour from Asker to Kristiansand 7 - 9 June. 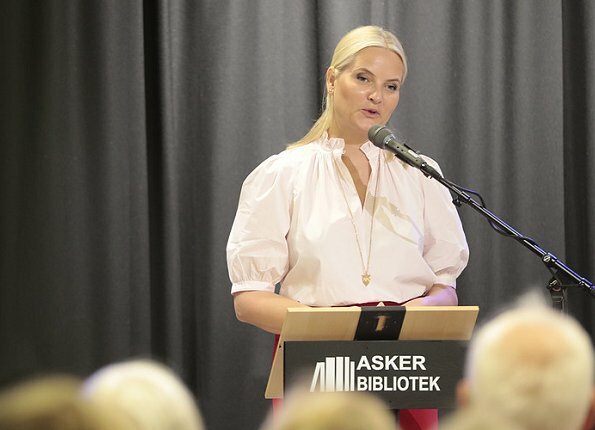 The first stop is Asker Library on June 7. Along the way from Asker to Kristiansand, the literature train stops at Bø in Telemark, Gjerstad and Vennesla. In addition, there will be an evening event in Dypvåg church outside Tvedestrand on June 8. The Literature Day ends in Kristiansand, June 9, specifically at Kristiansand Cathedral School, Gimle. At least she's not as frumpy as usual. She should change her hair style and stop over-bleaching it to death. Quite nice! She looks surprisingly good in white, considering her pale hair colour. Well, it's not Lagerfeld here. BUT: the 3 colours are good on her! Skirt and blouse are in the right size. Better fitting bra urgently needed! The trenchcoat, hmm, let's say: I wouldn't wear it to the supermarket. Shoes: NO! Awkward feet in picture 2! But I can't blame her for her hair-colour. I like it. It's Norwegian!! Yeah, she should do it after full moon, next week, good time then ;) ! No sense of what looks good and what suits her. That hair color has to go. I agree with you rainha leonor. Can't say anything favorable about her outfit, so I won't. Kudos for nice smile and friendly attitude. One of her better looks. Except for the shoes. I don't think that a different hair colour would be good for her. And a nice smile like hers is always in good taste. I imagine she is under constant pressure to fit the 'trophy wife' model of some of the other monarchies, so I am trying to not judge too harshly. If she starts wearing clothes that don't make her look like a sausage, than that would make a huge difference. I think that she looks nice, and she has a beautiful smile. The blouse and skirt suits her well, but personally I don't like the trenchcoat.